Both beginning and advanced home food gardeners will find something to interest them at the 4th annual Grow Good Food Workshop. The workshop will be held on Saturday, March 22, 2014, from 9 am to 4 pm at the Sedgwick County Extension Education Center, 4-H Hall at 21st and Ridge Rd. in Wichita. Cost of the class is $5 for all day. Register online at http://growgoodfood.eventbrite.com or call 316-660-0100. The morning session of the workshop includes three classes on basic gardening topics. 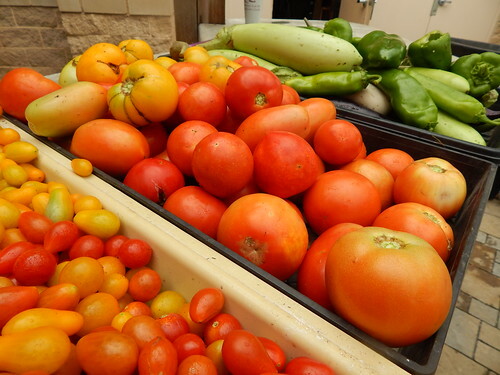 During the afternoon, attendees will have the choice between more advanced gardening topics and classes on preserving and cooking garden produce. Register online at http://growgoodfood.eventbrite.com or call 316-660-0100. Last year we had a Pizza Garden, this year we have a Salsa Garden. The thing that is kind of fun about the Salsa Garden this year is that we are doing it in Bed 10, which is one of the (ostensibly) 4′ x 4′ gardens. Lots of home gardeners plant gardens that size, but we usually use our small beds for miscellaneous things rather than for a themed garden. 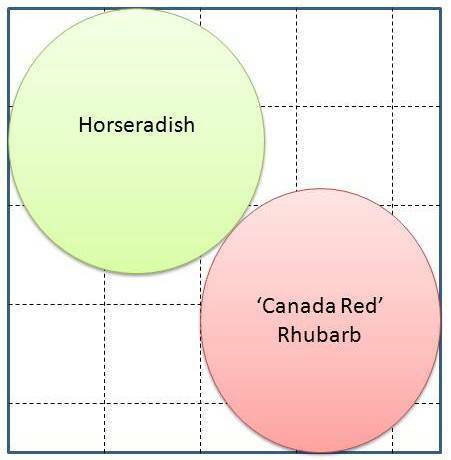 For instance, Bed 9 has horseradish and rhubarb. Bed 10 is actually 4’6″ x 3’10”, so not quite square. It doesn’t really change anything important though, because we still had to be very judicious with how we used the space. We decided to go with two roma tomatoes, a jalapeno, onions, and cilantro. ‘MiRoma’ is a red roma tomato that yields 5 oz. fruit on a determinate plant. 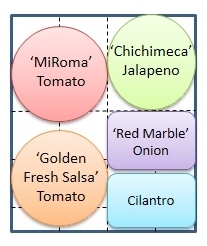 ‘Golden Fresh Salsa’ is a yellow roma tomato with 3-5 oz. 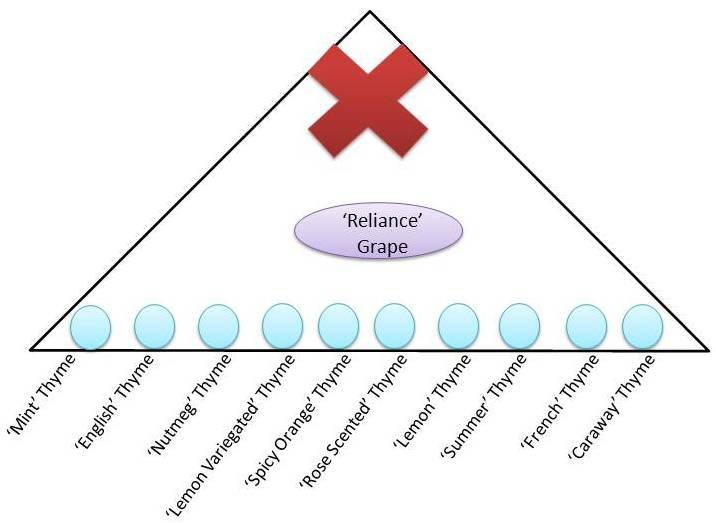 fruit, also on a determinate plant. The fruit are supposed to be very meaty without lots of seed gel (locular gel!) that can make salsa runny. ‘Chichimeca’ Jalapeno is a larger pepper with a kick of heat to it. We didn’t want a jalapeno that didn’t have any spice! This pepper is large for a jalapeno, with fruit about 2″ wide and 4″ long. It also is supposed to start producing earlier than other jalapenos. For the onions, we decided to use the rest of the bunch of ‘Red Marble’ cippolinis we will be planting in the Italian garden in the spring. We will follow with probably the bunching onions from the Italian garden in the fall. The cilantro will be planted in the early spring and once it blooms and goes to seed, we will pull it out and replant in the fall. It’s kind of a bummer that cilantro won’t grow during the peak tomato season here, but if we still have tomatoes in September, that will work out okay. Stay tuned for a little bit more about the herbs and flowers! Beds 7, 8, and 9 are going to be the same in many ways to last year. Bed 7 was the Thyme Garden last year and will continue to be planted to thyme this year. We are planning to replant the grapevine this year, probably trying ‘Himrod’ this time. Bed 8 is our Perennial Herb Garden. Given the harsh winter, we aren’t sure how much will survive. We also need to add more soil to the bed, so the plan is to lift anything that is still alive, add more compost, and then replant the whole bed. We have ordered some plants, but I won’t share the specifics of the layout until we know what is still alive and how things will be arranged. Bed 9 was Horseradish & Rhubarb last year and will continue in that role this year. The rhubarb never grew, so we filled in with Sweet Potatoes. We’ll be giving the rhubarb another go of it this year! Stay tuned for Bed 10 early next week. Sorry about the delay in continued updates on our garden plans! Between snow, illness, more snow, and lots of meetings, things got a little crazy for awhile. Bed 6 this year will feature a mixture of herbs, cutting flowers, and plants that are attractive to pollinators and beneficial insects. There is a lot going on in this garden! Like I said, a lot going on! 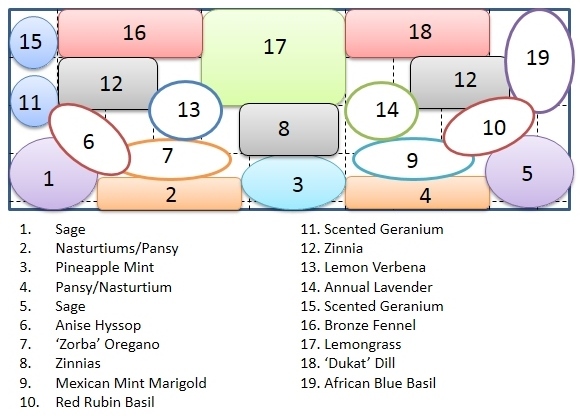 Here’s a few more details about some of the plants. 1 & 5. Sages – We’re going to be planting ‘Blue Anise’ and ‘Maraschino’ sages, which are fall-flowering sages rather than your typical culinary sages. 3. Pineapple mint is an attractive, variegated mint. We will attempt to keep it confined by planting it in a container and burying the container in the garden. It’s not perfect, but it helps! 6. Anise Hyssop – We’ve grown this before, and it has great purple spike flowers in the summer. 7. ‘Zorba Red’ Oregano is a variety that we found in the Richters catalog that has red-purple sprays with tiny white flowers in the early summer. 8. ‘Magellan Mix’ Zinnias – this is a shorter mix of zinnias that can be used as a border plant. 9. Mexican Mint Marigold aka Sweet Marigold aka Texas Tarragon is a heat loving annual that is related to regular marigolds, but isn’t much like them! It has small, yellow flowers that are bountiful in the summer and smells and tastes like tarragon, with a strong anise flavor. 10. ‘Red Rubin’ Basil – a red basil variety that has kept its red color pretty well in the past. 11 & 15. Scented Geraniums – We are getting ‘Peacock’ and ‘Lemon Sculpture’ this year. ‘Peacock’ has a rose scent to the leaves and is variegated. ‘Lemon Sculpture’ is a columnar type plant with curled leaves and a lemon scent. 12. ‘Benary’s Giant Mix’ Zinnias – These zinnias are about 3′ tall and are a great variety for cutting flowers. 14. ‘Goodwin Creek’ Lavender – We’ve had this variety before as it does well in the heat and blooms for most of the summer. 16. Bronze Fennel – This will be along part of the back edge as a filler plant and butterfly food! 17. Lemongrass – It’s been a couple years since we’ve had lemongrass in the garden. We’ll probably buy a stalk from the grocery store to root for this project. 18. ‘Dukat’ Dill – This variety is a heavy foliage producer before it starts flowering and seeding. If nothing else, the caterpillars will be happy about that! 19. ‘African Blue’ Basil – This is a vigorous plant with a stronger camphor odor than other basils. It flowers profusely and the bees love the flowers. It also has a purple tinge to the leaves and veins. Whew! I hope we can fit everything into the garden now that we have the seeds and plants ordered!